Razordeck Hire. Amazing speed of assembly. Ultra safe. We like the innovative design of the Razor Deck. One piece design, 3 working heights, fits through doors and assembles in seconds. No pasma training required. An excellent alternative to low level Scaffold towers and a complement to our podium step range. Why use a Razor Deck? You could use a scaffold tower and achieve the same platform height and there is work where this maybe a good course. For example, if you’re fitting a suspended ceiling you may want the largest platform area to work from. But on the other hand if you have no PASMA training the razordeck could be a better choice. A scaffold tower takes time to disassemble. If you have a multi room project to complete you would benefit from being able to drop the razor deck down, wheel it through a door and quickly raising it again. Scaffold tower hire can incur extra costs if components go missing. With a razordeck there are no detachable parts to be stolen/borrowed. The Razor Deck offers a stable work platform at three useful heights assisted into position by internal tensioning springs designed to power it’s ascent and control it’s decent smoothly and effortlessly. There are no loose components with the Razor Deck. The fail-safe, 1-piece design calls for minimal training. The unit unfolds from a compact easily manoeuvred base and simply snap locks into place at the desired heights. Adjustable integral outriggers provide additional stability and the ample deck provides space and support for the operative and tools. The simplicity of the razordeck design and its ease of use make it an excelent alternative to low level towers. The razordecks that we stock are the up to date 2008 onward model. 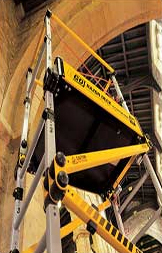 This model fully complies with the working at height (2008) regulations. Customers are saying the hire of a razordeck is saving a lot time on site. Being able to flat pack it quickly, roll it into the next room or into a hoist and set it up again in seconds is a real time saver. Q. Is it a scissor lift? A. No it doesn’t have motors or a battery, you won’t need IPAF training. The platform heights are achieved by the internal tensioning springs that raise and lower the platform with very little effort. Q. Is the Razordeck G.R.P? Q. Does the razor deck have stabilisers? A. Yes they unfold from the main unit and are adjustable to the floor. Q. Do you have to order the size you require like regular towers? A. No the 0.5m, 1m & 2m platform heights are achieved from the same unit. Q. Do I need PASMA training to use this on site? A. No because it isn’t component based like a regular tower. Q. When can you deliver it to me? A. We work on a guaranteed next day delivery. Q. Can I open an account with you? A. You can download our account forms here. Fax them back to us and we’ll set an account up for you, conditions apply.